Every new product to try and review is a blogger’s happiness. Some might probably say that beauty bloggers are sort of not contented but for me it’s more than that. Trying new products even if you are already using a good product for me is feeding the curiosity. What is there to review and blog about if you try nothing, right? On my previous posts, I mentioned about my favorite lotion but having a favorite doesn’t stop me from buying other lotions. :D I try to switch lotions from time to time to compare and of course, so that I have something to blog about. This time, my fancy was caught by Jergens Soothing Aloe Relief. Actually, I have been using this for more than a month already (the large bottle is half used) but the review came just now due to time constraints (as always!). Packaging and Appeal. The packaging of this lotion is nothing unusual. It is a typical cylindrical plastic bottle with pump (for the big bottle, smaller bottles have flip top cap). The body of the bottle is white while the pump as well as the flip top cap (for smaller bottles) is mint green. The lotion itself is creamy white with no specks or whatsoever. Effectiveness and Staying Power. This lotion keeps my skin moisturized all throughout the day. Staying in an air-conditioned from 9am sundown can make the skin dry. 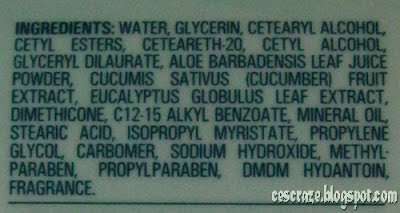 With some lotions I have tried before, I need to reapply midday as my skin starts to become dry, but not with this one. With this, I only have to apply once and still feel confident that my skin stays healthy and well-moisturized. I believe that the good effects I am getting from this lotion is in part due to the three natural ingredients namely; aloe vera, eucalyptus and cucumber. Ingredients. 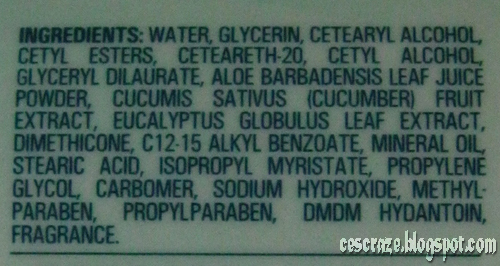 I love that this Jergens Soothing Aloe relief contains three ingredients said to have positive effects on the skin. These are the aloe vera known for its soothing, moisturizing and healing properties, eucalyptus for its capacity to treat acne, wounds, poorly healing ulcers, burns and other skin problems and cucumber for soothing and softening the skin. No wonder, this lotion smells good too! If you are a frugal consumer like me, then this product is for you. You will surely get more for less! For maximum result, apply the lotion right after stepping out of the shower to lock in the moisture your skin retained during bath. I always apply my lotion right after taking the shower too, when my skin's still soft. Otherwise the lotion will just feel sticky for the rest of the day. I always thought Jergens lotions are expensive. It's either they got cheaper or the economy allowed us more purchasing power now. Me too. Before, I didn't buy Jergens because they seem expensive. I only get to use such brand when someone from abroad sends us some. Actually this is the first time that I bought Jergens lotion.